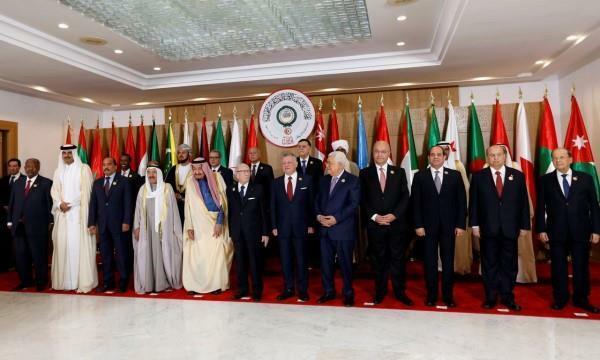 (MENAFN - Daily News Egypt) The 30th Arab League Summit kicked off on Sunday in Tunisia with the attendance of all Arab leaders, in which the Palestinian cause was the main topic of their discussions along with other regional issues. The summit began with a brief speech by Saudi King Salman Bin Abdul Aziz Al-Saud who expressed absolute rejection for any measures that impact the Syrian sovereignty over the Golan Heights, and reiterated Saudi Arabia's position in supporting the establishment of a Palestinian state in the West Bank and the Gaza Strip, with East Jerusalem as its capital. Tunisian President Beji Caid Essebsi announced that the summit is for "Determination and Solidarity,' calling on Arab leaders to unite in the face of regional challenges. In his speech, Essebsi asserted his country's support toward the Palestinian cause, and that his country will stand in support of the occupied Palestinian territories that should form the core of a future independent Palestinian state with East Jerusalem as its capital. He also highlighted the importance of coordinating the efforts of Tunisia, Egypt, and Algeria to maintain the security and stability of neighbouring Libya. 'The actions of some regional countries toward Arab countries exacerbate the conflict in the region,' Aboul Gheit stated, referring to Iran and Turkey.